@dendy Hehe, thanks for the update. Maybe you can let him out of the basement for 5 minutes. Can we please let the topics contains postings to the respective topic? This is not only "hygienic" but realy, realy helps to find stuff! It is required for a forum, IMHO. This topic is about "Feature requests, bug reports and forum" and how to handle them. It is NOT about some single instances of those points, better open own topics for that. Amen. Wish Vanilla allowed for some default text in the text box for certain posts only. In this case, we could add a note that said 'start a new thread, homie'. Or something. I will take care of getting the new categories added soon. Matt's not allowed out of the basement. He's lucky we gave him a toilet. I'm a volunteer so have extra patience pls. Will also try to split new requests/support requests from this thread into a new threads. We could just close this one down but would like to continue to allow for feedback on the OP. Feature wish: sample layers with velocity cross-switching. I would like to have multiple samples stacked on top of each other in a single zone, with the option to fade between them via velocity or other modulation. I think this is probably a feature request unless it's simply user rubbishness (quite possible). I just wrote a brilliant sonnet (fourteen lines and everything) and would like to now wander over to my iPad and copy it from mail and paste it into the notes section of the brilliant song I'm about to write in NS2, but there seems to be no pasting option which leaves me only with the default retyping all over again option. Perhaps not a big deal, but most certainly a big deal for me, so putting it in the pot here. Thanks much. Start reading the manual from this point. Precisely. I want to overlap multiple zones, possibly covering the entire keyboard range, and choose whether/how they cross fade. My old Ensoniq ASR-10 allowed up to 8 layers per zone, with up to 128 samples per layer. Each zone could cover any range of the keyboard, and you could choose whether/how they cross faded. Obsidian not only as a synth, but also as a sampler is in fact incredibly powerful. Way more powerful in many ways to my old E-MU Emulator E4 which was to many considered the DADDY of samplers. There is very little Obsidian cannot do. It’s not a feature or a bug. Possibly just an inconsistency. 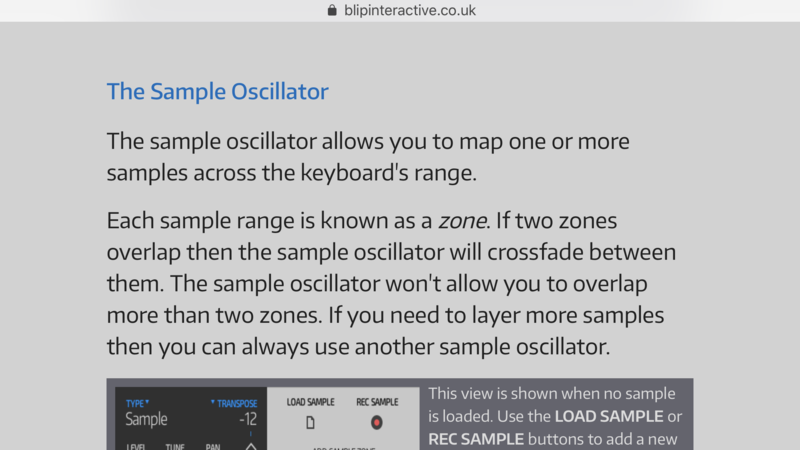 In Obsidian the “wavetable” option on the oscillators seems to be the only, if you rule out this one, section where the “slide up-down” does not change the current setting. I mean by pressing the name of the wave and sliding your finger up or down has no effect like it does in “PD” and “Noise” oscillators. As the “Wavetable” doesn’t have any substantial difference to the afformentioned categories, I could only guess it just escaped Matt’s attention, along with the sustain pedal of course, because of his agony to cram whatever feature he could imagine in there. because of his agony to cram whatever feature he could imagine in there. Thanks Matt I bought NS1 many moons ago and truly truly appreciate your work on NS2!!!! It is truly a master piece and my favorite daw!!!! Once audio tracks are ready I’m sure it will be my only daw of choice I love it that much I’ve been waiting for the iPad to get a daw like this since my first ipad (the iPad 2)..... Just like I want to take my music to the top I wanna take this daw with me..... With that said THANK YOU MATT!!!!! LET’S GET IT!!!! As a feature request Audio track support and freezing of midi tracks would not only be awesome but put the cherry on the cake. I sincerely hope this will come soon. I don't get this freezing thing. Sure, back in the day when we were rolling with IBM G3 PPC chips and P2's with MMX technology, and possibly wherever ARM was in the iPad 1 (A4? ), freezing made total sense. But now with super efficient Obsidian what is the actual point? Or am I missing something.
. But now with super efficient Obsidian what is the actual point? Or am I missing something. Not saying that i'm missing it - current resampling is completely enough for me - but i understand people who are looking forward for more simple way.. I really don't know what the fuss is all about concerning Model 15 either. Moog were obviously thinking 'Now if we make it look like a Moog, we'll trick everyone into thinking that it even sounds like one!'. It doesn't. At least to my ears. I have a friend who owns an actual original 3C and the 15 sounds nothing like a 3C, let alone an actual Moog. Well, ppl still want to use it, so I guess it sounds good. Freezing is a basic feature, so I’m guessing it makes sense with audio tracks. Freezing a midi track to create an audio track would then free the AUv3 synth so that it could be used time and time again. If you look in Cubasis you can freeze a midi track creating an audio track therefore giving you the option to use the same AUv3 as many times as you want without issues, essentially once a midi track is frozen the AUv3 is now not being used, so you can use it again & again as long as its frozen each time. There’s many reasons this is important, here’s a couple. Complete a complex song using several AU’s and have some/most/ or all of them crash on you for no apparent reason. Then reopen your project only to realize all the save states/sounds from those AU’s you originally picked are gone! And then try and remember which sound each one was and you’ll see the value with just that example that basic track freezing has for us. Even iOS updates could break a auv3 and with so many developers on iOS showing a pattern of rarely or never updating their apps to keep up with Apples changes this is very possible. Old songs you made won’t playback with your sounds etc. so Its very very important and saves you needing to export stems from every song every time you make a song in order to guarantee it’s always backed up. +1 for Track Feeze as a feature. Having said that, and it is only for you guys that I want it (I’ll only rarely ever use it), this is only a feature of convenience. Non-essential in my estimation. At some point you must ‘commit to tape’ and have your project as an audio file if anyone else will ever hear it, even if that is as a .wav mixdown or MP3. Sure. There are people who want to piddle with their tracks indefinitely and never ‘finish’ the track, never mixdown as a finished .wav file. This is a ‘perfectionism addiction’. Always being able to come back and tweak the composition. Never committing. Never finishing. Anyone who freezes tracks in another DAW must at some point commit that frozen track to audio. There is no escaping this. I can hardly imagine how difficult it must be to compose while freezing each track as you go rather than listening to what has been composed while working on each new track. One may as well compose on staff paper and just hear the music in your head. Record the track to audio and slap it in Slate. Move on. Name the track with the preset & AU name so you aren’t confused months or more later when you want to change something. Mute the track and continue using the AU of your choice. Track is “frozen” and the MIDI track is still there should you want to change things later. You can still make changes. No worries. This method will not force anyone to finish a song once and for all. You can still add lots of changes and never get to a final mixdown. Audio Clips is just a solid workflow that easily gets around the issues of not having ‘track freeze’. Pick your poison I guess. Extra steps? Sure. Better that than crashed AU/state saving, and the headaches that come with all of that. Track freeze may indeed come to NS2 with Audio Tracks (I’m just guessing), but that is still audio. How much should Blip have to do to work around inefficient code in resource hogging AU? I’m fine with the feature on the Wish List, but it should be way down the list after more useful features. IMHO. Just my opinion - no offense intended. It may have been mentioned before but is there any plans to add midi out to Track Output ? Ok didn’t realise NS2 had external midi tracks which I just come across disregard my above question, great! It would very handy to have a very simple audio track up with the tempo track to act as a guide track. It could just have volume, pan and mute. This might also serve as useful testing for Matt to check on the core functionality of the full IAP audio tracks - playback stability, sync, mix etc. Apologies for any redundant requests but first some bugs I noticed (or user error). When I load a sample in an oscillator, sometimes the amp envelope will no longer work with the oscillator. It’s seems random at this point. Is it not possible to retrigger a sample with out hitting the keys again for arp functions? I’ve tried to retrigger a sample by assigning a LFO to the amp envelope retrigger and this does not work like it does on a normal oscillator. Another issue is when I have a slate kit with more than 16 pads I won’t see the pancaked pads above with colored boxes making me think there’s nothing there. It’s not a big deal but when you share kits with your partners they could easily get the impression there’s nothing to see and bypass the sounds. Auto Beat: Please bring this back. I can only imagine how much fun it would be with the single velocity pad! 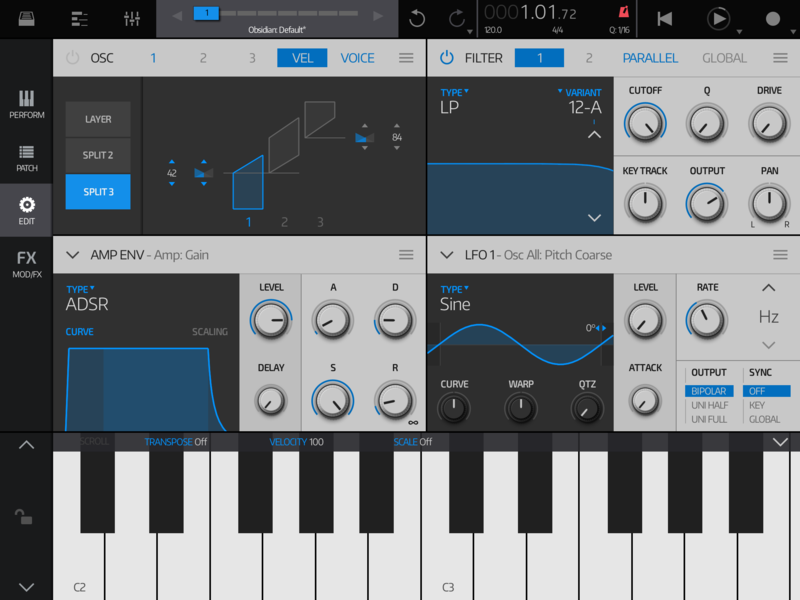 Waveshaper available in the synth fx rack. This became an important work flow feature for me using Nano and didn’t realize how important it was until I dove in on Nano 2. 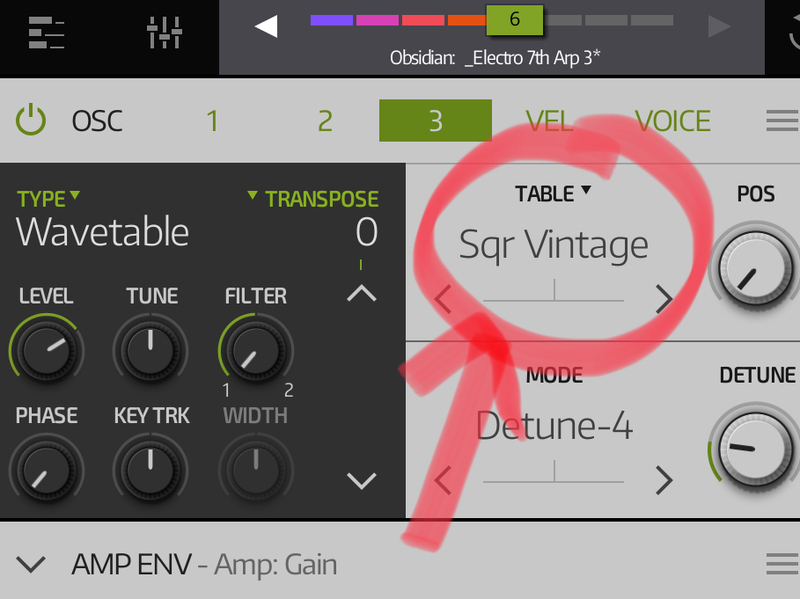 It just makes life so much easier having it right there as you adjust the synth parameters because it can be very important to the timbre of the sound your making. Having to go to the mixer and go back to synth is kind of demoralizing at times. That’s it. Having a great time using it so far. Thanks a lot for making Nano Studio.